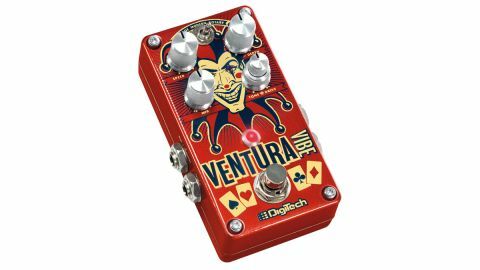 Ignore the joker on the box; the Ventura Vibe is a serious bit of kit. This sturdily-built, true bypass stompbox from DigiTech offers three vibrato and rotary effects. 'Vintage' is based on the classic 60s Uni-Vibe made famous by Jimi Hendrix, most notably on Machine Gun and his iconic deconstruction of The Star Spangled Banner at Woodstock in 1969; 'Modern' is described as a "pure pitch-based vibrato effect"; and 'Rotary' simulates a Leslie rotating speaker. The Uni-Vibe sound is convincing with that great phased-out wash that Jimi dug so much, while the Modern setting is as wobbly as a shell-shocked trifle, great for nailing the intro of Lucy In The Sky With Diamonds. Holding down and releasing the on/off switch automatically increases and decreases the speed on all three settings, but it's on the Rotary function that it really works at its best - it swooshes and throbs like the real deal. The Leslie was used by The Beatles in the 60s and you can also hear it on the epic guitar breakdown on Cream's Badge - one of the sample settings in the Ventura Vibe manual. Anyone who has tried shifting a Leslie cabinet between gigs will know how life-changing a pedal version is! Authentic sounds, bulletproof build quality and, despite not having a power supply included, worth every penny.